The government has produced an app designed to help health care providers conduct suicide assessments and develop safety plans for individuals at risk of suicide. Almost half (45%) of individuals who die by suicide have visited a primary care provider in the month prior to their death, and 20% have had contact with mental health services. Suicide Safe, released by the Substance Abuse and Mental Health Services Administration (SAMHSA), is free suicide prevention app which helps providers integrate suicide prevention strategies into their practice and address suicide risk among their patients. 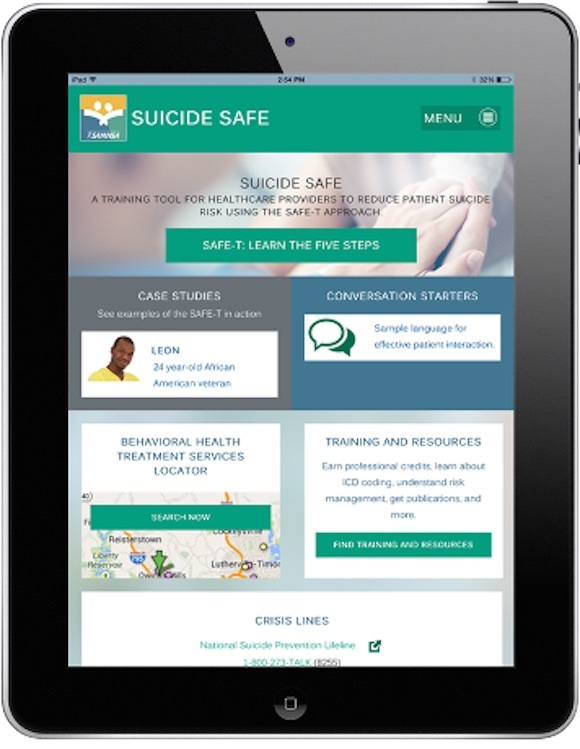 Suicide Safe is a free app based on SAMHSA’s Suicide Assessment Five-Step Evaluation and Triage (SAFE-T) card. Learn how to use the SAFE-T approach when working with patients. Explore interactive sample case studies and see the SAFE-T in action through case scenarios and tips. Quickly access and share information, including crisis lines, fact sheets, educational opportunities, and treatment resources. Browse conversation starters that provide sample language and tips for talking with patients who may be in need of suicide intervention. Locate treatment options, filter by type and distance, and share locations and resources to provide timely referrals for patients. Suicide Safe, SAMHSA’s free suicide prevention app, is available for iOS® and Android™ mobile devices. More details at the app website: Suicide Prevention Mobile App – SuicideSafe | SAMHSA.gov.